Revelation 3:20 – Listen! I am standing at the door, knocking; if you hear my voice and open the door, I will come in, to you and eat with you, and you with me. God is trying to get your attention. This is an imperative, a command from God Himself. He wants you to pay attention so you don’t miss an opportunity to connect more fully with Him. Are you looking for God in your world? I know I often talk about scripture is our trusted source for all things God, but that doesn’t diminish His awesome presence all around us. If you think back over the last two days, can you think of a way the Lord has tried to get your attention? Maybe it was the Pastor in your church, a friend, or even your child. Maybe it was in that near miss on the highway. Maybe it was the death of a loved one. LISTEN!!! To be honest, when I think of someone knocking, I can’t help but think of Sheldon from “The Big Bang Theory”. Whenever he goes someplace and has to knock on a door, he compulsively has to say the person’s name. Knock, knock, knock, Penny. Knock, knock, knock, Penny. Knock, knock, knock, Penny. Sheldon is persistent at knocking at someone’s door, so much so that if they’re there, they are compelled to open the door. I picture God doing that to the door to my heart and mind. Knock, knock, knock, Jill. Knock, knock, knock, Jill. Knock, knock, knock, Jill. He wants me to pay attention, and He’s willing to be annoying when He does it. God does many things to get our attention and bring us back to focusing on Him. God has something to say to us, and He’s not going away until you’ve heard it. Some of us close the door to God. We say that He can’t be real, that He isn’t reliable, that He doesn’t love us, that He didn’t create us, that He didn’t die for us so we could be with Him. Sometimes we try to ignore what is right in front of us. We’ve had lots of opportunities. People tell us about their faith, we see a miracle happen, or maybe we just hear the knocking, but some choose to block that out. Maybe they know that when they open the door to God, things are going to change. Some people won’t support them and some people will laugh. The Lord will begin to take priority over other things, and that can be a hard change for some people. They may start to also change their behavior, as the Lord continues to work in their heart. So what happens if we are open to what God is trying to say to us? We see it in this verse. He will come into us. He will become a part of us. He will eat with us, and we will eat with Him. Who do you eat with? If you’re at work, do you sit by yourself? Do you sit with colleagues? Maybe in school, you would sit with your friends. At home, you may eat with your family. In general, we tend to sit and eat with those with whom we have a relationship. God wants to have a relationship with us. He wants us to be close to Him and know Him. He wants to be an intimate friend of yours and mine. 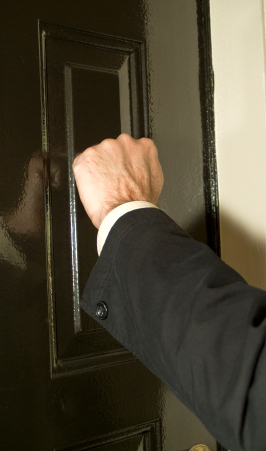 God is coming to your door right now, knocking. He wants you to open up and allow yourself to get to know Him better. Let Him come in, please. Revelation 3:20 – Listen! I am standing at the door, knocking; if you hear my voice and open the door, I will come in to you and eat with you, and you with me. Listen! God is trying to get your attention. This is an imperative, a command from God Himself. He wants you to pay attention so you don’t miss an opportunity to connect more fully with Him. Are you looking for God in your world? I know I often talk about scripture is our trusted source for all things God, but that doesn’t diminish His awesome presence all around us. If you think back over the last two days, can you think of a way the Lord has tried to get your attention? Maybe it was through the Pastor in your church, a friend, or even your child. Maybe it was in that near miss on the highway. Maybe it was the death of a loved one. LISTEN!!! I have to be honest, anymore when I think of someone knocking, I can’t help but think of Sheldon from “The Big Bang Theory”. Whenever he goes someplace and has to knock on a door, he compulsively has to say the person’s name. Knock, knock, knock, Penny. Knock, knock, knock, Penny. Knock, knock, knock, Penny. Sheldon is persistent at knocking at someone’s door, so much so that if they’re there, they are compelled to open the door. I picture God doing that to the door to my heart and mind. Knock, knock, knock, Jill. Knock, knock, knock, Jill. Knock, knock, knock, Jill. He wants me to pay attention, and He’s willing to be annoying when He does it. God does many things to get our attention and bring us back to focusing on Him. God has something to say to us, and He’s not going away until you’ve heard it. So what happens if we are open to what God is trying to say to us? We see it in this verse. He will come into us. He will become a part of us. He will eat with us, and we will eat with Him. Who do you eat with? If you’re at work, do you sit by yourself? Do you sit with colleagues? Maybe in school you would sit with your friends. At home you may eat with your family. In general we tend to sit and eat with those whom we have a relationship. God wants to have a relationship with us. He wants us to be close to Him and know Him. He wants to be an intimate friend of yours and mine. God is coming to your door right now, knocking. He wants you to open up and allow yourself to get to know Him better. Let Him come in, please. Who are you eating with?